BRISTOL - The Central Connecticut Chambers of Commerce is looking for vendors for its first job fair specific to manufacturing and the trades. The event is also a networking opportunity that will be held on Thursday, Oct. 4, at the Double Tree by Hilton in Bristol from 9 a.m. to 4 p.m. Businesses can register to be vendors at CentralCTChambers.org. The event is free to attend and is presented by TD Bank. The Central Connecticut Chambers of Commerce manages two manufacturing associations. It has a manufacturing committee and a tech advisory council made up of manufacturers and people in the trades. Cindy Bombard, president and chief executive officer at the chambers of commerce, said the lack of available workers is a common issue among the local manufacturers. Because of the number of job openings and the need for workers in the manufacturing industry, the chambers of commerce decided to organize the job fair. In addition, October is manufacturing month, and members of the chambers of commerce said the fair would be the ideal way of welcoming it. Katie D’Agostino, marketing and communications director at the chambers of commerce, said there are 10,000 open jobs in manufacturing in Connecticut. “All we needed to do is to start to try to match individuals looking for work and companies that are hiring,” Bombard said. Some of the vendors that will attend the event are Electric Boat, Stanley Access Technologies, Goodwin College, the Connecticut Department of Labor, Total Mechanical Systems, Trumpf, and Etter Engineering. The fair will also be a learning experience for students looking for career options. 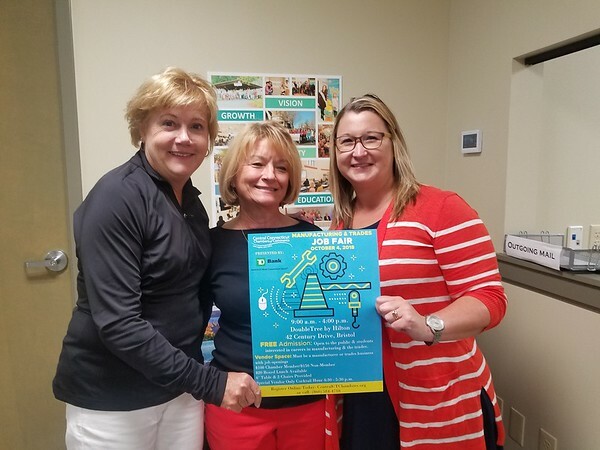 The town of Plymouth and the city of Bristol school systems will bring their senior students to the fair to help them start exploring a career path in trades and manufacturing. To learn more about the manufacturing and trades job fair visit www.centralctchambers.org . Posted in The Bristol Press, General Business, Manufacturing on Monday, 10 September 2018 20:49. Updated: Monday, 10 September 2018 20:52.